Circle H Lodge, an historic house from the early 1900's, is near Leakey in an area of the Texas Hill Country noted for magnificent scenery. The lodge is located in a lovely, secluded valley on Circle H Ranch. This is a working ranch devoted to the preservation of wildlife and is home to many species of both native and non-native animals. The lodge is decorated in Cowboy High Style with antiques and Cowboy -Indian memorabilia. There is a natural rock swimming pool in front of the lodge. During the evening hang out with family or friends at the old cantina located behind the lodge. This two-story lodge has been completely renovated. It has central heat and air-conditioning and provides all the amenities. There is a large living and dining area. The five bedrooms will sleep up to 16 people. Rates are based on up to 10 people. Additional people up to 16 can be accommodated for an additional fees. For Groups 15-30 CALL for pricing on our additional GUEST HOUSE #2. Two bedrooms have king beds, one bedroom has full size bed with pullout trundle and standard twin. One bedrooms has a pair of twin beds. Sunroom has two daybeds with pullout trundles. In addition, one downstairs bedroom has one full bed. There are two full baths with one on each level. The upstairs air-conditioned and heated sunroom provides a comfortable place to relax while enjoying the beautiful view or provides extra sleeping accommodations. The well-equipped kitchen includes a large side-by-side refrigerator, convection double oven, microwave, dishwasher , crockpot and all cooking essentials. A barbecue grill and a fire pit are provided for outdoor cooking. The spacious yard that surrounds the lodge is perfect for picnics. Hang out at the old cantina behind the lodge for anytime fun. 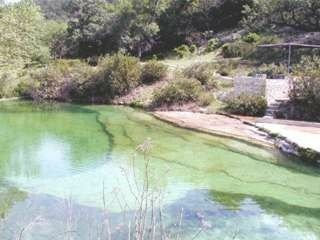 Other activities in the area include hiking, swimming, photography, summer rodeos, or floating the Frio River. The numerous migratory routes, which cross this area, provide almost limitless opportunities for bird watching. There are several restaurants in the area. Garner State Park is 8 miles from the lodge. Lost Maples Natural Area is a 30- minute drive. The city of San Antonio is approximately 1 1/2 hours away. It is 6 miles to the county airport. Smoking outside only please. No pets. Cancellation Policy: No refunds given, but credit is given to re-book within one year. $100 re-booking fee. Float/Tube rental available nearby. Complementary pool floats are available for lodge pool use during your stay. Experience a one of a kind vacation at this exotic animal ranch. The lodge is nestled among the hills and perfect for the ultimate family vacation in the hill country. Why fight the crowds and noise at the river when you can have your very own secluded natural spring-fed pool that keeps a consistent water level year round. If you care to venture out to the river, it's only a 10 minute drive down the road. Not only are you getting a great house with all the amenities, you also get to experience an exotic vacation right here in Texas. Your kids will love to see and learn about the many different species of exotic hoofstock that we have on the ranch. In addition, we have great hiking and glorious colors on our hills when the seasons change. Lodge is a short walk down to cool, refreshing natural spring pool. Private to lodge guests. Additional table for extra seating is available in Great Room. Also, kitchen has table with seating. Historic house has central heat & air, 2 king beds, 2 full beds, 5 twin beds, 3 trundles, huge kitchen & living/dining area. All bedrooms upstairs except one full size bed downstairs. One full bath up & one full bath down. Grounds are 2 acres of carpet grass & oak trees, spring fed limestone swimming pool, shaded cabana, hammocks, horseshoe and washer pits, BBQ facilities, fire pit for bonfires, cantina. Family Favorite - Beautiful, roomy, fun and peaceful. This is our second year staying at Circle H. We love the home, yard, swimming hole and pet deer. The only disappointment was the weather. It was stormy the last day and we couldn't swim. Everything else was awesome! We had the best time, and thoroughly enjoyed our stay. There was plenty to do for the complete age ranges we had (age 4 years to 52 years). I really appreciated the opportunity to show my granddaughter a glimpse into my childhood. Jen was great, and we will certainly be back. I am so grateful my children get to experience our great state of Texas here. It is truly a reason to adore our Texas. It is fun. It is joyful and so relaxing. A true escape from it all. Love, love, love that y'all loved it as much as we do! See you back soon!! I highly recommend the Circle H Ranch lodge. Privacy, swimming, hiking. We enjoyed our stay at the Circle H Ranch lodge and it accommodated our family of 10 very well. The hiking, swimming, and relaxing in the hammocks made it a perfect vacation get away. Dear Rita: Thank you so much for the kind words. It was a pleasure meeting you and your family. We look forward to seeing you back soon. All was wonderful! Only bad thing was you had to leave! This weekend could not have been more perfect. The lodge was located at the end of the ranch drive in a nice and private area. We were able to stay on the ranch and enjoy the amazing spring fed pool. We were told the river wasn't a very enjoyable float this memorial day weekend so I daresay we had the best spot in all of Real county. Jen and her husband were incredible hosts and made the stay even better. We will most definitely be back and may even make this a yearly ritual. The location and beauty of this area was only surpassed by the loveliness of the home and the hospitality received. Due to this specific house I will probably never opt to stay at Garner State Park again, well as long as this place is available. Many thanks for your awesome review! It was so nice meeting you and the rest of your group. We look forward to seeing you back next year. In an area of the Texas Hill Country noted for magnificent scenery, the lodge is located in a lovely, secluded valley on Circle H Ranch. The two-story lodge is completely renovated, has central heat and air-conditioning and provides many amenities. There is a large living and dining area. The five bedrooms plus upstairs sunroom are each uniquely decorated in western style and will sleeps 16 people. We can accommodate more people for an additional charge per person per night. Ask about our Guest House for Groups 15-30. For over 10 people.....each person is an additional $50 per night per person. An upstairs sunroom provides a comfortable place to relax while enjoying the beautiful, panoramic view. The kitchen is well equipped as well as an outdoor barbeque and firepit are available. Other Activities: Other activities in the area include hiking, horseback riding, swimming, fishing, photography, golf, summer rodeos, tubing or floating the Frio River, antique shopping, retail boutique shops, motorcycle rides or car rides on 'The Three Sisters' (RR 335, RR 336, RR 337), nightly family-friendly dances at Garner State Park, helicopter rides over the river and through the hills out of Concan, local bars, and live music. In addition, the numerous migratory routes, which cross this area, provide almost limitless opportunities for bird watching. Golf: Golfing is nearby at Concan. Rates are based on an 10 person occupancy. Each additional person over 10 is $50/per night/ per person. $695-$1,095/ ni ***Credit card is required to keep on file for incidentals and/or excessive need for cleaning until after stay. Any damages or need for excessive cleaning caused by guests will be charged to the credit card on file. The person who made the reservation is responsible for their group, and any persons who may visit them. Thank you for helping us remain safe, friendly & pristine. Winter & Spring OFF Season (after Labor Day - before Memorial Day): $695/2 night minimum or $595/night for 3 or more nights or 1 full week at $3000/week. BE SURE TO ASK FOR DISCOUNTED RATE OF $595 FOR MORE THAN 3 NIGHTS DURING OFF SEASON. 1 night stay available and charged at holiday rate of $1095. Re-booking Fee is $100. Summer & Holiday Guests receive 15% discount during Winter/Spring OFF Season following summer/holiday stay(only non-holiday nights are discounted).